Don't forget to check the July program page for info on this final weekend of July. The August page is also available if you want to plan ahead. Did you know that yesterday was National Intern Day? I was already working on this post when I found out, so that must mean something, right? Thank you to all of our interns and to the staff and volunteers who serve as mentors, teachers, and supporters. So we're nearing the end of summer intern season, and I hope that all of our interns have had a great experience with PHMC. Some interns apply through the PHMC Keystone Summer Internship Program and are placed at the State Archives, State Historic Preservation Office, State Museum, or one of our Trails of History sites. Others apply directly to a site that interests them. Our intern mentors work hard to provide real-world experience and exposure to a variety of professional activities and issues. For some, an internship is a brief interlude on the way to another career (let's be honest, internships can be great for figuring out things you don't want to do with your life). For others, an internship helps build a resume and establishes personal and professional relationships that will last long after the summer has ended. A Facebook post from the Anthracite Heritage Museum (AHM) featuring one of their summer interns illustrates the lasting impact of internships. The post is shown below, but what you don't see are two comments from past AHM interns. One said, "Congrats, Anna! I was one of the first interns there. Best of luck." The second said, "Same here. I was an intern 9 years ago for the museum. I really enjoyed my time there and hope you do too Anna!" I think that speaks volumes about the intern experience, not to mention the connections that social media enables. Another AHM intern is chronicling her experience via her university website. Amber is working with curator John Fielding to learn about cataloguing museum collections and mounting photos for an exhibit, sharpening her public speaking skills by giving tours and working with public programs, and researching local history about the Lithuanian community (read all about it on Misericordia University's Local History Projects site). The Pennsylvania Historic Preservation blog recently shared info about Keystone interns spending the summer in the State Historic Preservation Office and a related program that is run in cooperation with PennDOT. And my thanks to Courtney Goodzinski, interning with Linda Bolla at the Erie Maritime Museum this summer, for sharing about some of her projects. Courtney is working on a master's degree in public history at Indiana Univ. of PA and expects to graduate in May 2018. Being able to read about Vice Admiral Kohler’s service to our country and his achievements in life was a wonderful break from renaming image files and researching artifacts. It’s stories and projects like this that remind me that being involved in public history isn’t always about the next big, flashy exhibit. 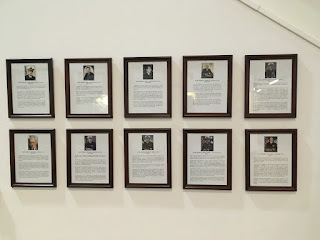 Sometimes it’s as simple as making sure we properly honor and share the stories of those who served in the past and preserve the stories of those who are currently serving in order to share them with future generations. This experience is one of many that I’ve participated in while interning, and they all helped confirm that I made the right career field choice. To Vice Admiral Kohler and all others who have served and are continuing to serve our country, thank you for your service and dedication. The July program page has info for the remainder of the month; I've highlighted some events below for this weekend. This week's post has something resembling a theme. Maybe it's more of a thread. I noticed a bunch of posts in my Facebook feed that highlighted the multiple ways the PHMC's Trails of History sites help to preserve historic structures, landscapes, and lifeways. That's probably true most of the time, since, y'know, that's what we do. But it felt like a convergence, so I'm sharing. Since late June, the U.S. Brig Niagara has been away from the Erie Maritime Museum, visiting U.S. and Canadian ports around the Great Lakes. This week they are in Quebec City for a tall ships event, one of a series of "Rendez-vous 2017" festivals celebrating the 150th birthday of the dominion of Canada (created in 1867 as a confederation of British colonies Canada, Nova Scotia, and New Brunswick). Canadian Prime Minister Justin Trudeau was on hand Wednesday to help launch the Quebec City festival and posed with crew members from the ships, including Niagara captain William Sabatini (2nd from left in front row in the tan shirt). Pretty cool. Now that we've gotten that out of the way, Eckley Miners' Village shared a post about a visit from two historians from the Historic American Buildings Survey (HABS) program. Camille Westmont and Lisa Pfeuller Davidson were on site to document four types of worker housing as part of a study of anthracite mining towns in northeastern Pennsylvania. The HABS program was created in 1933 through an joint agreement of the American Institute of Architects, the Library of Congress (which houses the documentation), and the National Park Service to preserve through documentation a complete range of American building types "from the monumental and architect-designed to the utilitarian and vernacular, including a sampling of regionally and ethnically derived building traditions." HABS is now one of the National Park Service's Heritage Documentation Programs, along with the Historic American Engineering Record (HAER) and the Historic American Landscapes Survey (HALS). 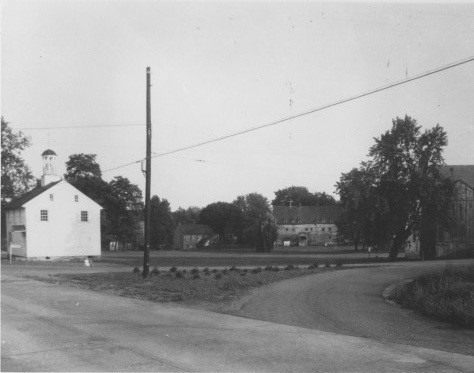 In 1937, HABS worked to document Hope Lodge, a Georgian mansion owned at the time by William and Alice Degn and now part of the Trails of History. According to the site guidebook, the Degns received a certificate from the Dept. of the Interior the following year declaring Hope Lodge an outstanding example of Colonial architecture. Hope Lodge recently shared some photos from the HABS project via the Library of Congress. You can search or browse more HABS/HAER photo collections in the Library of Congress online. 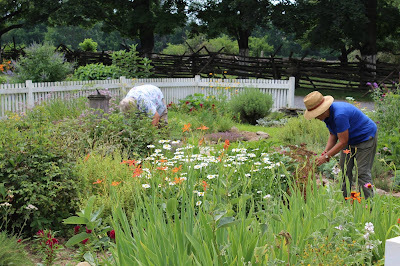 Staff and volunteers of Landis Valley Village and Farm Museum's Heirloom Seed Project (photo above) have been busy cultivating and weeding as we move into the heart of the summer. The site's Facebook page has had numerous posts with lovely photos of the flowers and vegetables that are to be found growing around the site. On a somewhat darker note, the Pennsylvania Lumber Museum shared info about a new documentary, Cathedral: The Fight to Save the Ancient Hemlocks of Cook Forest, which will have showings Friday and Saturday, July 28 and 29, at the Cook Forest Sawmill Center for the Arts (info, trailer, and online tickets). Rangers from Cook Forest State Park will take questions from the audience about the ongoing battle against the hemlock woolly adelgid. And I'll bookend that with this video clip from Pennsbury Manor's garden. This Sunday you will find the gardeners there, ready to talk about what's growing and ready to pick (see listings below for more info). July 22-23: Civil War Weekend—the site is transformed into a rural Pennsylvania village during the Civil War, with reenactors portraying soldiers and civilians (more info). The Landis Collections Gallery will have an exhibit on Abraham Lincoln's visit to Lancaster in 1861. Admission charged; tickets are available online. Food will be available for purchase at the museum store. (Read more in this LancasterOnline article.) 10 am-4 pm both days. June 22: Saturday Spotlight—this week, decorative arts. Included in regular admission. 11 am-4 pm. June 23: Special Sunday Programming—this week, chat with the gardeners and the brewers and see what they're up to. Included in regular admission. 1-4 pm. July 21: Lecture—as a lead-up to this weekend's living history event, Dr. Ron Lenox, museum volunteer and retired Armstrong chemist, will present "Napalm and Agent Orange: Two Iconic Chemical Weapons of the Vietnam War." 6:30-7:30 pm. July 22-23: VIETNAM Revisited—living historians will be on the grounds portraying American combat and support troops “in country” in the late 1960s (more details and photos from previous events are on the website). 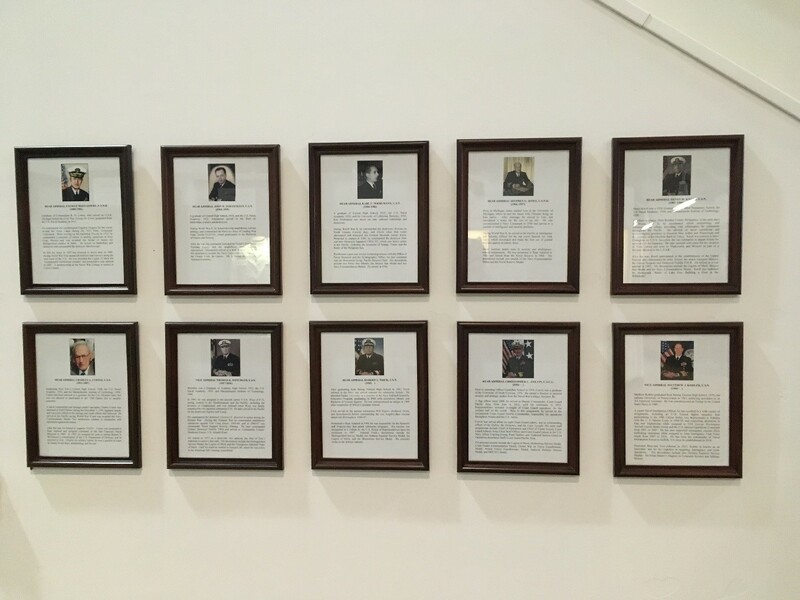 Julie Decker, DNP, RN, of the Penn State School of Nursing, will present "The Real China Beach: U.S. Army Nurses in Vietnam" at 10:30 am on Saturday in the museum auditorium (regular admission rates apply for the lecture). Folks from public media organization WPSU will also be on hand to talk about their upcoming film, A Time to Heal, which documents the experiences of Pennsylvanians during the Vietnam era (see promo above and more info on Facebook). 10 am-4 pm (tactical demo at 1:30 pm each day). July 22: Exhibit opening—"Unraveling the Woof" is this summer's exhibit. Included in regular admission. July 21: Free Summer Friday and Learn at Lunchtime—admission is free today, 9 am to 5 pm, and there will be a paleontology program in Nature Lab, 12:15-12:45 pm. July 21: 3rd in the Burg—enjoy light refreshments and a tour of the Art of the State exhibit(on view thru Sept. 10), then visit the Susquehanna Art Museum (SAM) for a tour. SAM's Director of Education, Tina Sell, will conduct the "Art of the State Tour," and Ophelia Chambliss, artist and PHMC Commissioner, will conduct the tour at SAM as part of a program called "The Great Summer Switch" (info on Facebook). Admission is free for this event. 5:30-7:30 pm (State Museum tour starts at 6 pm, SAM tour starts at 7:30). July 21-23—celebrate the Park's centennial, learn to fish, and gaze at the stars, not necessarily in that order. More info on the website. Be sure to check out the July program page for events coming up. PLEASE NOTE that the State Museum and Archives Complex in Harrisburg will be closed to the public tomorrow and Sunday, July 15-16, for completion of a major electrical upgrade. "History" means different things to different people. Recent news about changes at Colonial Williamsburg, as one example, prompted discussion (at least among the folks in my Facebook and Twitter feeds) about whether or not anyone values history, other than those of us who are professional purveyors of it. On the other hand, museums are working very hard to continue to be places "where the truth can be found." I assume that readers of this blog are conscious of "history" every day in some capacity or another and that I spend much of my time in that space as well. I think, however, that everyone is a consumer of history, deliberately or otherwise. That is partly because I know that the present is profoundly influenced by events and conditions of the past. But the present is equally influenced (maybe moreso?) by the stories we tell ourselves and each other about the past (and the future). Facts matter, but we don't always agree on what the facts even are, let alone what they mean. The past was complicated. Studying the details of everyday life, political life, military conflict, what have you - it shows us that we in the present day are not alone in time. The people who came before us had to deal every day with the uncertainty of "tomorrow," as we do now. Sometimes we can learn from them; sometimes we have to be content with their companionship. A number of news items ran across my desk this week that highlight the ways we preserve and use history, the value that work has to our communities, and the connections history helps us make. At the same time that U.S. military forces were arriving in Europe to fight alongside French and British troops 100 years ago, the Commonwealth of Pennsylvania was moving to commemorate an important event in an earlier conflict. On July 25, 1917, Washington Crossing Historic Park was established to mark the spot where General Washington and his Continental Army crossed the Delaware River on December 25-26, 1776, to strike Hessian forces in Trenton and to honor the memory of the soldiers fighting for American independence. To celebrate the park's centennial, free tours and events are planned for next weekend (the only event requiring a reservation is the birthday party on July 23). For more information, visit WCHP's Facebook page. A recent article in the Times-Tribune announced that Scranton has beaten out Bethlehem and Boston to host the 2018 International Conference on Contemporary Cast Iron Art. The conference, which occurs every four years, has not been held in the U.S. since 2002. The article notes that the Scranton Iron Furnaces and its annual Arts on Fire festival were key factors in drawing the conference, which will focus on "post-industrial iron." Arts on Fire includes a variety of artisan activities, including an iron pour and glass blowing (more info). The event and the community partnerships that make it possible have helped to bring attention to Scranton's south side and the Iron Furnaces. Much logistical work remains for the May 28-June 2 conference, which is expected to bring 800-1,000 people to Scranton. In an op-ed piece responding to an article in the Pittsburgh Post-Gazette that painted a grim picture of Westmoreland County, county commissioner Ted Kopas (D) cited numerous factors that he believes are cause for a more optimistic view. Among them was Bushy Run Battlefield, which Kopas included (along with other heritage sites) as a great place for history buffs and one of many recreational opportunities for the public. Earlier this week the Tribune-Review provided an excellent overview of Bushy Run's summer history day camp. Reenactors worked with site volunteers and staff to teach 25 campers about Native American life in the area at the time of Pontiac's Rebellion. Last year's camp focused on British military life and next year's will look at British colonists in the area. 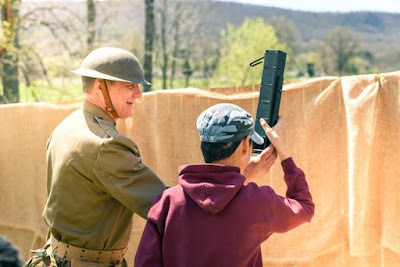 The online version of the article includes video of the camp activities and a nice segment with reenactor Tom Vecchio explaining the value of sharing history and lifeways with the campers. You can see reenactors representing Native Americans, British military, and colonial settlers at the annual commemoration of the Battle of Bushy Run, August 5-6. At Old Economy Village, changes are happening to the way visitors experience the historic buildings. Now, rather than taking a single guided tour that includes all the major buildings (especially those where security, safety, and collections care needs prohibit a self-guided tour), visitors will have some choices. They'll still start at the Visitor Center to purchase tickets and see the orientation film and exhibits and they will enter the historic area via a tour of the Natural History Museum/Feast Hall. But at that point they can choose self-guided tours of the Blacksmith Shop (newly expanded), Cabinet Shop, Community Kitchen, and Carriage House or guided tours in several different "zones" including the Cobblestone Street Buildings and/or the George and Frederick Rapp Houses. On special event days and Spotlight Saturdays, additional craft and trade demonstrations or other activities will be available as well. Visitors who enjoy guided tours and have more time to spend on site still have the option, and visitors who prefer to be more self-directed can structure their time to their liking. 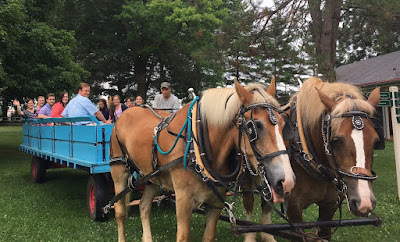 The Mansfield Free Public Library recently posted photos of a visit to their summer reading program by PA Lumber Museum site administrator Josh Roth, who brought hands-on activities to the library to help teach about history. The Lumber Museum has been working with all kinds of partners to share lumber and forestry history with the public in local communities and to encourage visitation to the museum. Mansfield is one of a growing number of local libraries participating in the museum's library pass program, which provides free regular admission to the museum's indoor and outdoor exhibits. The July program page has events listed through the end of the month. I've highlighted some of this weekend's events below. Before we jump ahead to the weekend, I thought I'd share some coverage of recent events at sites, ongoing projects, and well, just some stuff I found interesting. Thanks Facebook, Twitter, and Google Alerts! 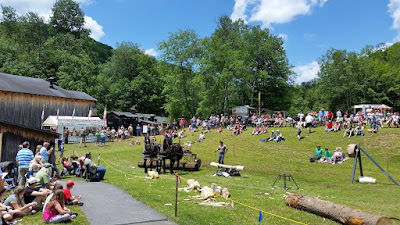 Pennsylvania Lumber Museum's annual Bark Peelers' Festival (which commemorates the early 20th-century gatherings of lumbermen for feats of strength and airing of grievances) drew about 2,000 people June 1-2 for music, food, history, and demonstrations of skill. The museum shared photos of the overall event and the birling (log rolling) contest on Facebook. Aerial/Renegade/AlexanderRenn Photography shared a great overview video on their Facebook page. 450 people attended the annual Ringgold Band concert at Conrad Weiser Homestead, honoring local veterans and carrying on a long-time tradition. You'll find info in this Reading Eagle article. The Reading Eagle also reported on Daniel Boone Homestead's Independence Day Celebration on July 1 (see article here). Somerset Historical Center's 3rd annual "Frosty Mugs of Thunder" brewfest took place on July 1 and the Daily American has photos to prove it. Young visitors to the PA Military Museum on July 4 were given the opportunity to try on military gear from the museum's education collection and sit in a World War II era jeep. "Kids' Day: Dress Up and Discover" is presented 3-4 times throughout the year as part of PMM's hands-on history offerings (next event is August 12). There are photos on Facebook. 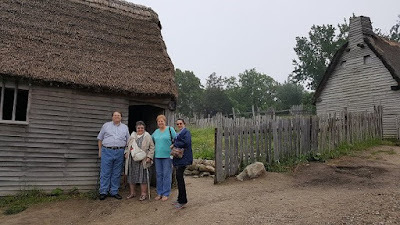 Ephrata Cloister museum educator Michael Showalter (left in photo above) led a recent field trip to New England (group shown here at Plimoth Plantation). You'll find more photos of the trip on Facebook, along with lots of other photos of the site highlighting its history and activities. An article in the Wilkes-Barre Times Leader highlighted numerous visitors who attended Patch Town Days at Eckley Miners' Village to explore their Irish roots. Several Trails of History sites are included in VisitPA's summer road trip itineraries: Pennsbury Manor and Washington Crossing Historic Park are found on Day 2 of the "Philadelphia and Countryside North" road trip, and The State Museum of PA (Day 2) and the PA Military Museum (Day 3) are on the Military History road trip. The Anthracite Heritage Museum's blog recently featured several guest posts about a choral group from Valley View High School's recent tour to Wales. On a related note, the museum will host a lecture on July 16 about movie star and singer Allan Jones, an Old Forge native who grew up in a family of Welsh coal miners. July 8: Annual Classic Car Cruise—classic and custom cars, live music, food, drink, and more. Event is free; regular admission applies to visit the exhibits. 11 am-4 pm. July 9: Annual 5K Bushy Run Trail Run/Walk—Bushy Run is the site for this annual event benefitting the Penn-Trafford Area Recreation Commission (PTARC). For more info and to register, contact PTARC at 724/744-2171 ext 205 or lbires@penntwp.org. 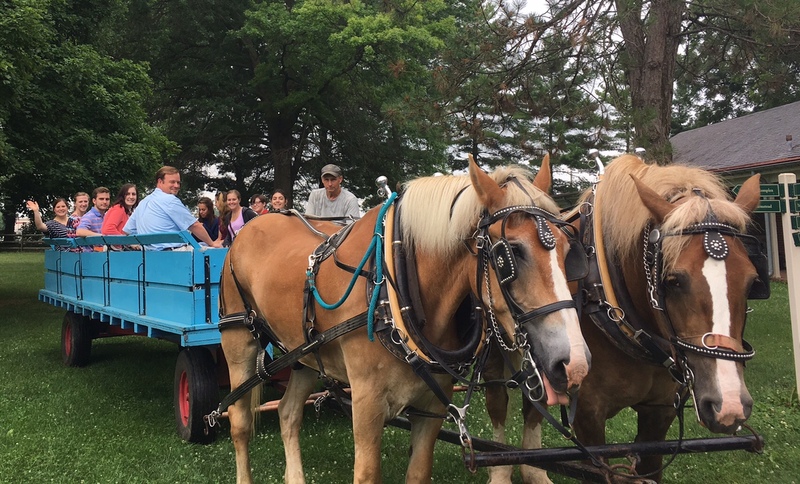 July 9: Living History Sunday—enjoy a summer afternoon at the homestead learning about life in the Tulpehocken. Noon-4 pm. July 8: Presentation—"18th-Century Law" will explore legal issues and include some 18th-century law books and forms. 2 pm. July 8-9: open hours—Historic Pithole Open. Admission charged. 10 am-4 pm. July 8-9: Guided Tours of the Museum—museum docents will offer overview tours of the museum's exhibits twice daily on weekends this summer, hours will vary. This weekend, tours are at 11 am and 2 pm both days. 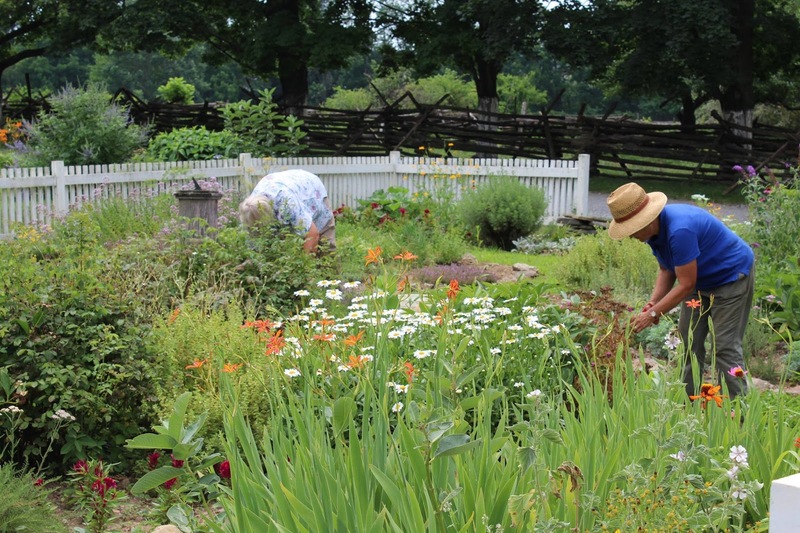 July 8: Saturday Spotlight—this week, Meet the Gardeners. Included in regular admission. 11 am-4 pm. July 9: Special Sunday Programming—this week, Pirates in the Tavern! (living history theater). Included in regular admission. 1-4 pm. Thru July 9: Reading Railroad Days—offered in conjunction with the Reading Company Technical & Historical Society, this program features an enormous HO-scale model railroad and highlights Reading Company rolling stock in the Museum’s collection. Details are on Facebook. Included in regular museum admission. July 8-9: Living History Weekend—help commemorate the 100th anniversary of U.S. involvement in World War I. Regular admission charged. 10 am-5 pm. July 7: StoryTime—this month's selection is Roadwork, by Sally Sutton. The read-aloud session will take place in the Pennsylvania Turnpike exhibit and children will have a chance to explore. StoryTime is geared to children ages 3-5. Included in regular admission (which is free on July 7). 10-11 am. July 7: Artist Conversations—artist and PA First Lady Frances Wolf and artist Andrew Guth, winner of this year's first place award for Works on Paper, will lead an informal tour of the 50th Art of the State exhibit. Admission is free today. 12:15-12:45 pm.